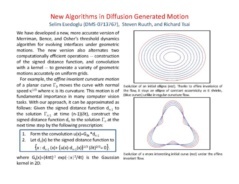 Esedoglu, S.; Ruuth, S.; Tsai, Y.-H. Diffusion generated motion using signed distance functions. UCLA CAM Report 09-29 (March 2009). Journal of Computational Physics. 229:4 (2010), pp. 1017-1042.